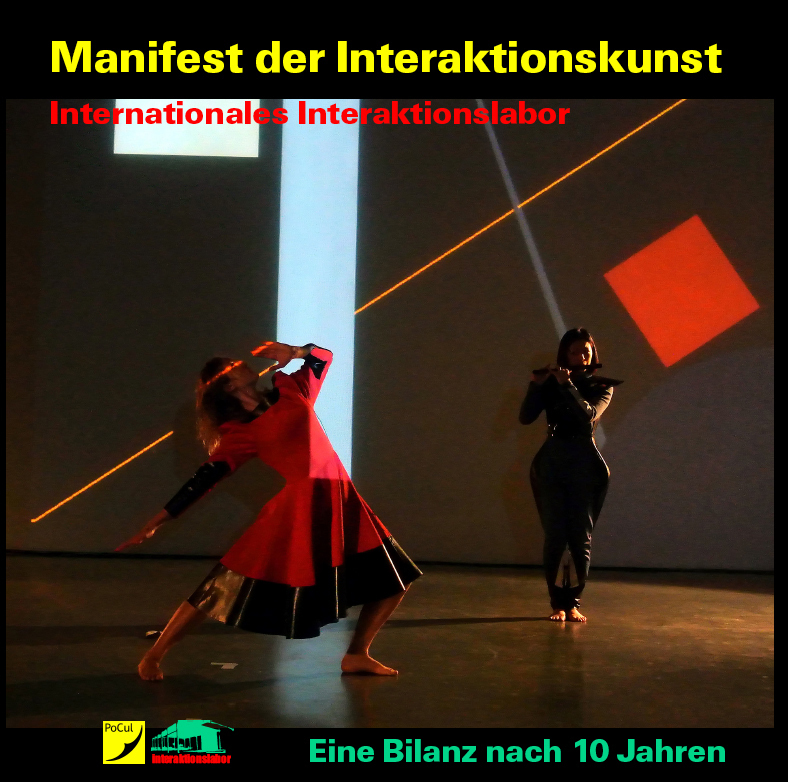 International Interaction Laboratory publishes "Manifesto of interactive art"
Edited by Klaus Behringer and Johannes Birringer (for PoCul Publishers), the book describes the history of the interaction laboratory and its gradual evolution into one of the most unusual cultural phenomena of the Saarland region. Since 2003, this autonomous media lab has attracted artists, engineers and computer scientists from around the world, offering two-week residencices every summer for the exploration of the artistic potential of new interactive media. The participants experimented with software and sensors, performance, sound and film compositions, conducting research into interactive architectures and real time processes. They also developed prototypes for productions that were later presented on stages or in galleries, while debating the possible outlines of a manifesto. This book takes stock not only of the interactive experiments, but also of these programmatic and poetic discussions that took place over the past years. After a historical review of the laboratory by its founding director (introductory chapter), the book presents two versions of the manifesto in German and English, followed by seven further chapters written by members of last year's laboratory, including a video essay by Turkish artist Hayriye Koç Basara, a critical essay on interactive dance by Italian choreographer Vanessa Michielon, and a detailed analysis of interactive wearables by British designer Michèle Danjoux who had prototyped several of her remarkable costumes in Göttelborn. The American dancer Anna Kroll reflects the phenomenon of temporality in art, while Vanessa Vozzo writes about interfaces in interactive installations. Local authors Uschi and Andreas Schmidt-Lenhard enrich the book with humorous meditations on the problem of interaction, while co-editor Klaus Behringer offers a moving account of his "outsider perspective" as a photographer and longtime observer of the working methods of the laboratory. The longest chapter in the book transcribes the "Göttelborn Debates” on the apparent impossibilty of a “manifesto” for interactive art, illuminating contentious issues, technical and philosophical implications, and the social and political significance of contemporary media practices. Elliott O’Brart: "Interactive Manifesto notes"
Hayriye Koç Basara: "About Collaboration"
Vanessa Michielon: "How to dance in live interactive dance?" Michèle Danjoux in conversation with Vanessa Michielon and Johannes Birringer: "Interactive Technologies, Costume Design and Choreography"
Andreas & Uschi Schmidt-Lenhard: "Interaktion / Kunst / Labor"
Vanessa Vozzo: "Reflections on conceiving an interface for interactive artworks"
Anna Kroll: "Thinking about Time"
Klaus Behringer: "Noema kaputt? Über Fotografie und Interaktion"
Klaus Behringer, Andreas Lenhard, Uschi Schmidt-Lenhard, Johannes Birringer: "Das Manifest über Interaktion: Gespräche und Überlegungen (2007-2013)"